Who wouldn’t like their own personal shopper? By utilizing link tracking and shopping history, you can send messages about products that are relevant to each customer’s interests. This is referred to in the industry as an Event Triggered Email. There are many ways you can utilize this information (from birthday discounts to product ratings), but for now I’m focusing on product triggered messages. Below are six types of messages you can be sending and some helpful takeaways. Do: Give a reason to buy: Customer service, price match service, urgency, sale, etc. 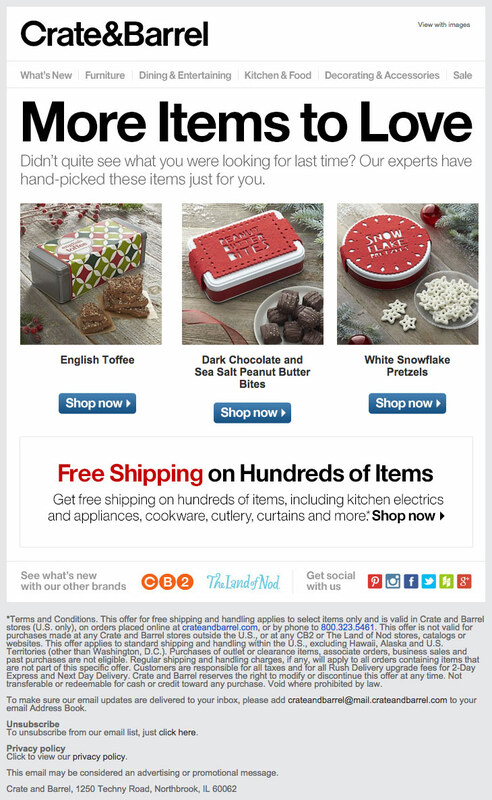 This email is similar to the last example, but with more products. It’s well made, (and this is just my humble option) but I’m not a fan of the wording chosen for the CTAs (show me more). Show me more, what? Products? Something like, “shop now” or “check it out” sounds a little more product specific. I might recommend running some tests on a few options. Testing is always a good idea in general — get the most out of your messages by seeing what customers respond to best. Subject Line: We picked these just for you! 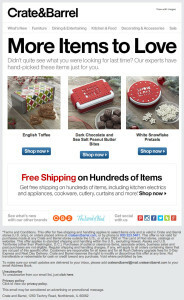 I love that this email shows a product you’ve viewed, along with corresponding suggestions. Sometimes your suggestions feel out of left field and you’re left wondering — why on earth would they think I would like that? This email clearly answers that question. The variety of image sizes also makes the design more appealing. They also included a secondary message for “favorites,” which is a nice addition. Still thinking about this item? Use this code for X% OFF! Express pulls out all the stops with this email. They offer a one-day only discount for free shipping. They also include corresponding products and a few best sellers. Sometimes an incentive like a personal discount is what the customer needs to get them ready to buy! Subject Line: WOW. 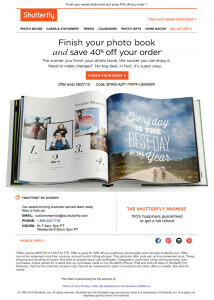 40% off to finish your photo book. 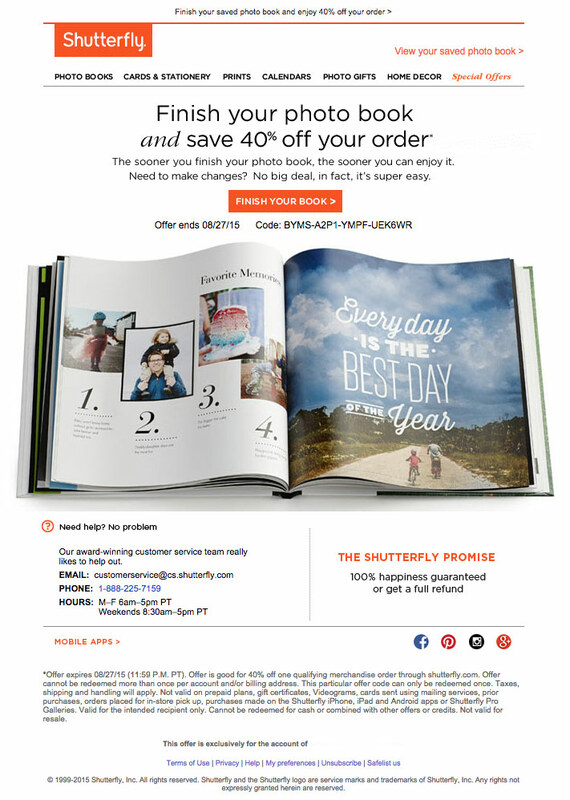 Shutterfly also offers a great incentive to order — 40% off! I like the image choice and the bold CTA, but the headline is a bit long. Don’t forget– you left this in your shopping cart. The copy in this email is straight forward and scannable. My biggest gripe — I would have preferred it if they included the product image or name in the email. Subject Line: Come back soon – items remain in your cart! Williams-Sonoma adds some urgency by placing a time limit on how long the product will remain in the shopping cart. If you’re not ready to bring down the price as an incentive, this is an easy way to add motivation without hurting your bottom line. I also like the inclusion of the product image, the offering of product support, and the recommendations. Subject Line: Going, going, gone! Don’t let the items in your Shopping Bag sell out. I am really impressed with how specific this email is! Rather than just telling me that I left items in my cart, the email shows me my entire shopping cart with products and current prices! They also finish it off with a few recommendations at the bottom. Nicely done. We saw you eyeing this, take another look. Subject Line: Thinking about it? It’s still waiting for you. I like the customer support angle that this email took. They make reaching them effortless while keeping the email personable. I loved the wording Express chose for this email. My favorite is actually easy to overlook; in the preheader, “It’s called retail therapy for a reason.” Followed by the body copy, “Not to make you feel guilty, but your closet is getting pretty lonely.” It’s clever and fun, making the email feel less generated. They also include related products without calling them out as being such, continuing the natural flow. The varied image sizes add to the design. Finally, they include best sellers. This item is now available! Subject Line: This item’s back in stock and we wanted you to be the first to know! What a helpful and unique way to use target messaging! By reminding a customer that a product they viewed in back in stock, it may light a fire to order it before it goes out of stock again. Subject Line: They’re Back! Your Waitlist Items Have Arrived! Here is a similar email from Forever 21. Their copy includes more urgency, “Snag them now before they’re gone (again! ).” They also include additional must haves. That item you’ve been eyeing is on clearance! 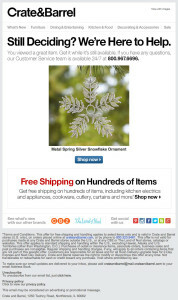 Similar to the emails that offer an exclusive discount, this email makes the customer aware that the item is on sale. I don’t know about you, but I can’t resist a deal, so I would LOVE to know when a product I’m interested in is available at a lower price. Not interested in this item anymore? If they do click that link, turn a negative experience into a positive one. Allow the customer to select categories that they ARE interested in so you can better understand and target them in the future. Maybe even offer a discount or other incentive for filling out their preferences! During the holiday season, one thing retailers can count on is customer unpredictability. Shoppers are no longer buying for themselves, but for everyone else. No amount of data collected over the year can anticipate what type of product your customer’s Aunt Margret will want. One strategy to overcoming this obstacle is sending a “shop by person” email. Rather than focusing on the product, these emails aid in narrowing the search by focusing on the TYPE of person you are shopping for. It’s easy for this genre of email to fall short on originality and interest. However, UncommonGoods delivered two outstanding examples this season. The designs are festive and fun. The categories are specific, cover a variety of personalities, and are (surprisingly) original/varied between the two emails. This email does such a great job of capturing the feeling of a classic claymation movie. The email scene is set with paper clouds dangling from strings, carefully chosen fonts and a little world of objects and characters made entirely of clay. Even the star atop the tree twinkles in an animated gif. The setting fills the email, tying everything together. The categories themselves are circles of varied size and placement, creating flow and interest. The addition of colored drop-shadows adds dimension. They even include a link to a video, bringing the characters to life with music. 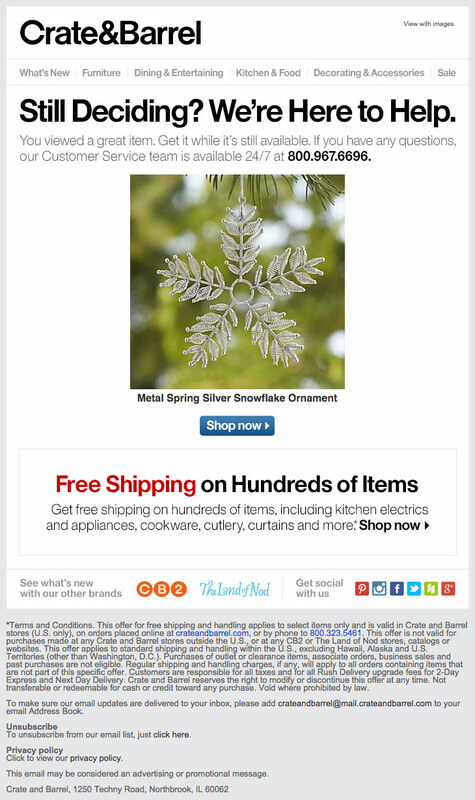 Just in case the previous category options didn’t cover everything, they finish the email with a few general gift ideas, an option to shop by price, and a link to sale items. Subject Line: Your List Comes Alive! The headline of this one grabbed my attention right away. The quickly recognizable lyrics instantly put the song in your head as you read them. I like that it’s a lyric not often seen used (like fa la la la la for example). The design is made up of hand-drawings of the “person of interest” in a holiday setting. Everything flows well, again breaking away from the grid. The placement of the text, how one image interacts with another, and the use of pointing cues all contribute to the movement. 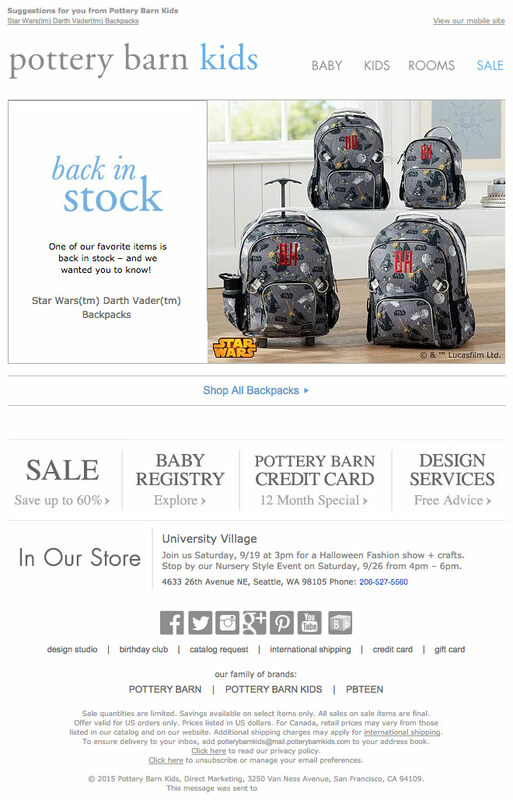 Again, they finish the email with additional options by including links to general products and new arrivals.